What happened to my Settings, Playlists, Channel and Video Manager? Note: as of March 2019 this "old desktop experience" is still partially available, but is gradually being replaced by a newer layout. The account navigation links all still work. Last week YouTube made a significant change to navigation. Clicking your channel avatar used to display an extensive menu at the top of the page, but now all you will find is more simplified menu that lets you select Creator Studio, settings or switch channel identities. Several options - such as your Video Manager - are now several clicks away. The top of the navigation menu displays the email username of the Google account you are signed into, and below that the channel identity you are using. If you want to switch channel identities, just select the channel from the list. Included in the list are Google+ Pages you manage that don't yet have a connected channel, they are labeled "Create Channel". Not surprisingly, selecting one of those Pages will start the channel creation process. If you are signed into more than one Google account, you will see your other Google account emails listed under "Other Accounts". The two other options you'll see in the menu are "Creator Studio" and a gear icon. Creator Studio leads to the channel dashboard (www.youtube.com/dashboard), where you will find an overview for your channel, and links to creator tools, including your Video Manager, comments, messages, analytics, video editor and more. The gear icon links to your Youtube settings (www.youtube.com/account). I'll discuss both in more detail below. 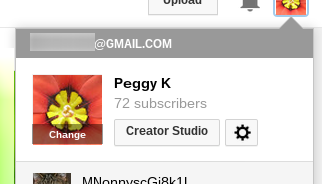 You can jump directly to the Google+ Profile or Google+ Page connected to your channel by simply clicking your channel icon a second time. If you create and upload videos to Youtube the biggest change to navigation is the disappearance of the direct link to your Video Manager. Now your Video Manager and other creator tools can be found in the new "Creator Studio". 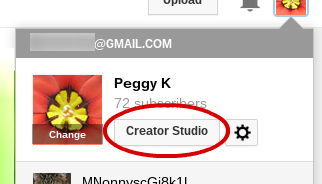 Click your channel icon in the upper right corner, and select "Creator Studio". That will bring you to your YouTube Dashboard (www.youtube.com/dashboard). You can add widgets to your Dashboard to show recent stats, uploads and comments. Hover your cursor over the widget and you'll see a grid you can grab to reposition it on the Dashboard. Some widgets also have a gear icon - click it to change the settings for that widget. 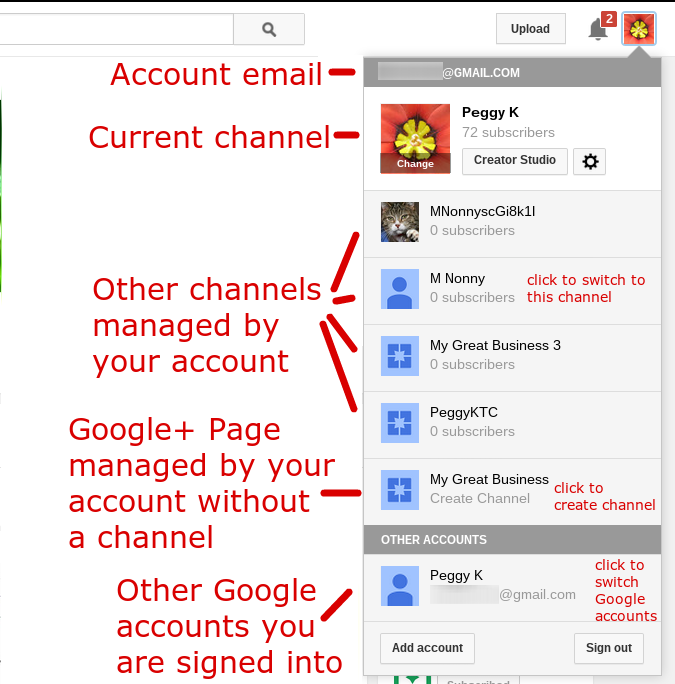 Learn more about the Creator Dashboard in the YouTube Help Center. From the left menu you can navigate to all the Creator Studio tools you need to manage your channel and videos. I've included the direct links below, which you may want to bookmark to directly visit the tools you use most frequently. 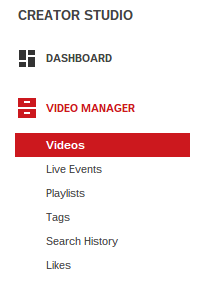 Learn more about your Video Manager, Live events, playlists, and search history in the YouTube Help Center. 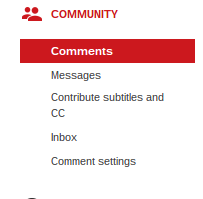 Learn more about comments, private messages and contributing subtitles in the YouTube Help Center. Learn more about your channel features, advanced channel settings, upload defaults, InVideo programming, Fan Finder program and monetization in the YouTube Help Center. 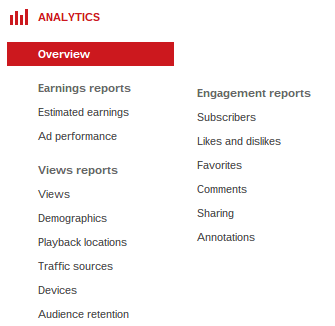 YouTube Analytics (www.youtube.com/analytics) provide detailed stats about your channel's traffic, viewers, engagement and more. Learn more about YouTube Analytics in the YouTube Help Center. Learn more about the Audio Library and Video Editor in the YouTube Help Center. 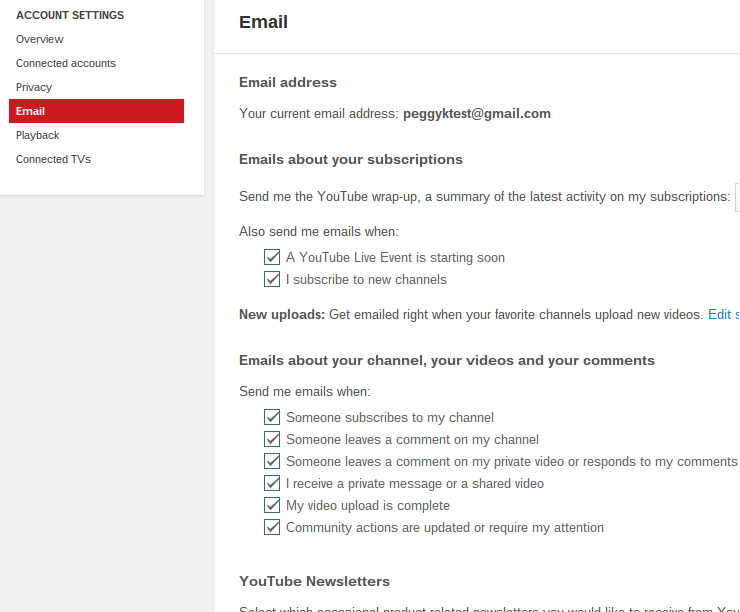 To manage the settings for your Youtube account, click your avatar in the upper right corner, then click the gear icon. that will take you directly to your account settings overview (www.youtube.com/account). Manage "feed settings on your channel": set which of your activities are shown as public "Recent Activity" on your channel. 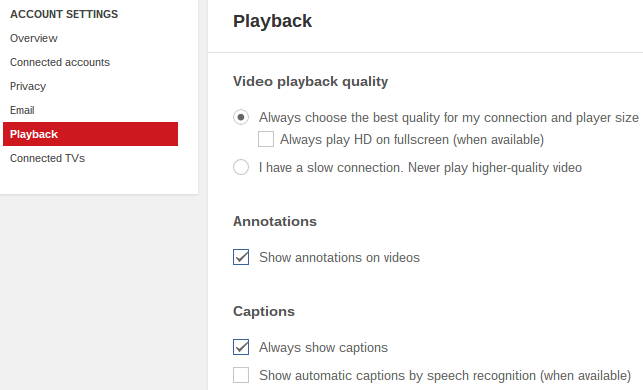 Set default preferences for video playback quality, annotations and captions. Pair your smart television or video game console with your YouTube channel to play videos on your TV. Learn more about pairing devices to YouTube on TV in the YouTube Help Center. 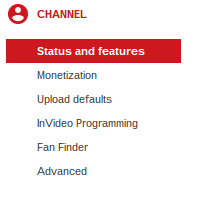 You can find settings for monetization, upload defaults, InVideo Programing and your advanced channel settings by clicking your avatar in the upper right corner, clicking Creator Studio, then navigating to your "Channel" settings (www.youtube.com/features). If your channel doesn't have a custom URL, you may have trouble navigating to your own channel. 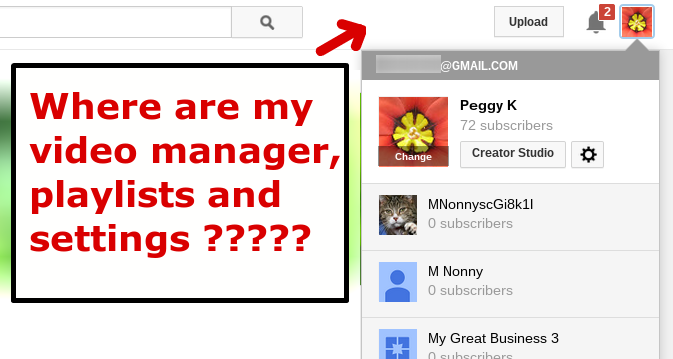 Fortunately there is a link in the left menu - the Guide - to "My Channel" which will take you there. Once you are on your channel you can add channel art to the header, edit your "Channel navigation" to change your channel layout or set which actions shows up in your Recent Activity Feed, or navigate to your Channel settings. 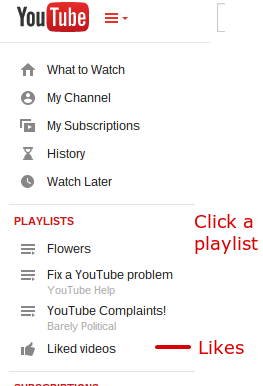 You can view your Playlists from anywhere on YouTube by expanding the left navigation Guide. Your playlists (including your "Favorites' and "Liked videos" playlists) will be listed under the Playlists heading. You can manage a specific playlist by clicking it's name on the Guide. If you want to manage all your playlists you can do so by clicking on your avatar in the upper right corner and selecting "Creator Studio", then clicking "Video Manager" in the left menu. You will then see links to "Playlists" and "Likes" in the left menu (see above). 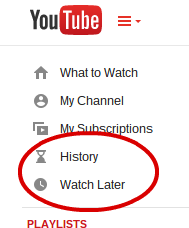 There are links to your Watch Later list and viewing History at the top of the left Guide. The Guide also lets you easily view and manage your subscriptions. 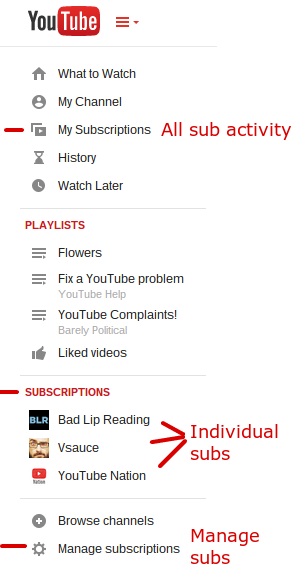 At the top of the menu is a link to My Subscriptions (www.youtube.com/feed/subscriptions). Click that to view a feed of activity from all of your subscriptions. Under the Subscriptions heading is a list of all your individual subscriptions or subscription collections. 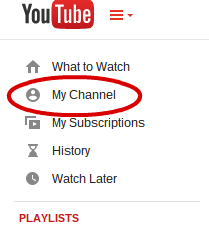 Click those to navigate to a specific channel you have subscribed to. At the bottom of the menu, click Manage subscriptions (https://www.youtube.com/subscription_manager) to manage all your subscriptions, change your settings or create collections. If you have questions, first check the YouTube Help Center.